Die Mercurii, videlicet, 13 die Julii. E. of Holland to deliver the Petition to the King. Message to the H. C. to appoint a Committee to join him. King's Letter to the Speaker. Message from the King, for Hull to be delivered up to Him. Message to the H. C. for a Conference about it, and to deliver the E. of Warwick's Letters. Report from the Committee about a Lwooeum Tenens during the L. Mayor's Consinement. Committee of the H. C. to go with the E. of Holland to the King. Colonel Butler to give Security not to go to Ireland during the Rebellion. E. Lincoln Leave to be absent. L. Mayor to appoint a Locum Tenens. Arms from Hull to be stored in the City. E. of Holland to acquaint the King, there was no other Letter of His stopped bu the one sent Him. and with an Order concerning Martin College. 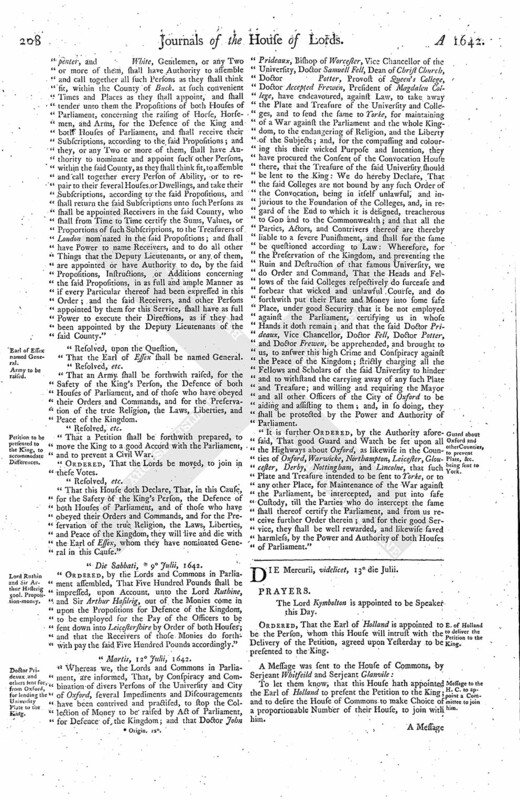 King's Printer sent for, about the Proclamation for the Commission of Array. Order for 5030£. to be paid to the Garrison of Portsmouth. The Lord Kymbolton is appointed to be Speaker this Day. Ordered, That the Earl of Holland is appointed to be the Person, whom this House will intrust with the Delivery of the Petition, agreed upon Yesterday to be presented to the King. To let them know, that this House hath appointed the Earl of Holland to present the Petition to the King; and to desire the House of Commons to make Choice of a proportionable Number of their House, to join with him. Right Trusty and Right Well-beloved, We greet you well. Our express Will and Command is, That, at the First Sitting of our House of Peers after the Receipt hereof, you deliver this Our Message unto them, to be afterwards communicated to Our House of Commons; and for so doing, this shall be your Warrant. Given under Our Sign Manual, at Beverley, this 11th Day of July, 1642. "To Our Right Trusty and Right Well-beloved the Speaker of Our House of Peers." By Our former Declarations, and this Our Proclamation (which We herewith send you), you and all Our good Subjects may see the just Grounds of Our present Journey towards Our Town of Hull: Before We shall use Force to reduce that Place to its due Obedience, We have thought fit once more to require you that it may be forthwith delivered up to Us, the Business being of that Nature that it can admit no Delay; wherein if you shall conform yourselves, We shall then be willing to admit such Addresses from you, and return such Propositions to you, as may be proper to settle the Peace of this Kingdom, and compose the present Distractions: Do your Duty herein; and be assured from Us, in the Word of a King, that nothing shall be wanting on Our Part, that may prevent the Calamities which threaten this Nation, and render Our People truly happy. If this Our gracious Invitation shall be declined, God and all good Men judge betwixt Us. We shall expect to receive Satisfaction concerning Hull, by your Answer, to be presented to Us at Beverly upon Friday next, the 15th of this present July, 1642." Next, the King's Proclamation was read; declaring the King's Intention to go to Hull. Ordered, To communicate this Message and Proclamation to the House of Commons. To desire a Conference, concerning a Message received from the King; and to deliver the Letters to them, that came Yesterday from the Earl of Warwicke. The Lord North reported, "That the Committee hath spoken with divers of the Clerks of the Mayor's Court; and they were asked what the Course was, to supply the Mayor's Place, in case he be sick or absent; and they say, they know of none but a Locum Tenens, which is appointed by the Lord Mayor, because he is to be accountable for what he doth." That they have appointed a proportionable (fn. 1) Number, to join with the Earl of Holland, to present the Petition to the King. That they have delivered the Letter concerning the Earl of Warwicke to the House of Commons; and that (fn. 2) they will give a present Meeting with the House of Commons. Upon reading the humble Petition of Peregrin Herbert and Edward Saul, the one a Clerk and the other an Officer to the Lord Mayor of London; shewing, That they have, for the Space of Ten Days, been committed by this House, for proclaiming a Proclamation, which came from the King's most Excellent (fn. 3) Majesty, directed by Writ to the Lord Mayor and Sheriffs of the City of London; the Petitioners, being both Servants to the Mayor and Sheriffs, did by the Command of the Lord Mayor proclaim it, as they have upon Oath humbly answered to this House. "The Petitioners, being sorry that they have offended this House, humbly submit themselves to the Favour and Mercy of their Lordships, desiring to be discharged of their Commitment." Ordered, That the Petitioners shall be released, as is desired. Upon the Petition of Sir George Whitmore; it is Ordered, That he shall be discharged from the Custody of Colonel Butler; and that the Sheriffs of London shall take Care to provide him some convenient Place, where he may be kept in safe Custody, until he shall give Security not to go into Ireland during the Rebellion there. Ordered, That the Cause between Ward and Watkins shall be put off until this Day Fortnight. Ordered, That this House proceed against the Nine Lords To-morrow. Ordered, That the Earl of Lyncolne hath Leave to go into the Country for Three or Four Weeks. Ordered, That the Lord Mayor be commanded presently to depute some Person to be Locum Tenens, for the Government of the City of London, and calling of Common Councils. Ordered, That the Committee for the Safety of the Kingdom shall advise with the Committee for the Militia of London, about the appointing of convenient Places for the Storing of the Arms and Ammunition that came from Hull; and to Order them to dispose of it accordingly. Ordered, That the Earl of Holland shall acquaint the King from this House, "That there was but One Letter of His Majesty's to the Queen brought to the Parliament, which was taken about Mr. Ashburneham; which was the Letter sent to the King from the Speaker of this House. 1. That the Examinations concerning the Lord Magwire, may be delivered to some Members of their House. 2. That they are ready for a Conference desired by their Lordships, concerning the Money to be paid to the Scotts. Agreed, To give a Conference To-morrow Morning. 4. To desire their Lordships Concurrence in an Order made concerning Martyn College. (Here enter it). Send an Answer, by Messengers of this House. 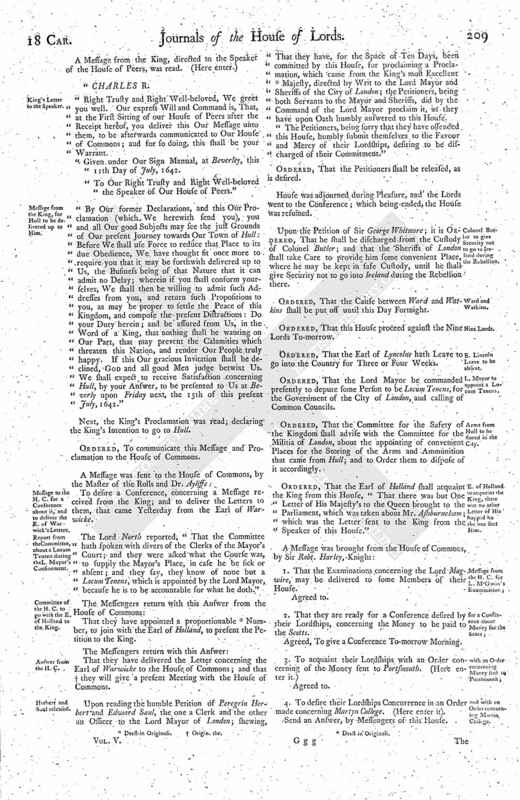 That their Lordships do agree that the Examinations of Magwire, &c. shall be delivered to some Members of their House, as is desired; likewise this House agrees in the Order concerning the Five Thousand and Thirty Pounds to be paid to the Garrison of Porsmouth; and their Lordships will send an Answer, by Messengers of their own, concerning the Conference, and the Order concerning Martyn College. Ordered, That the King's Printer shall be sent for, to produce his Warrant for printing and renewing the Proclamation concerning the Commission of Array. 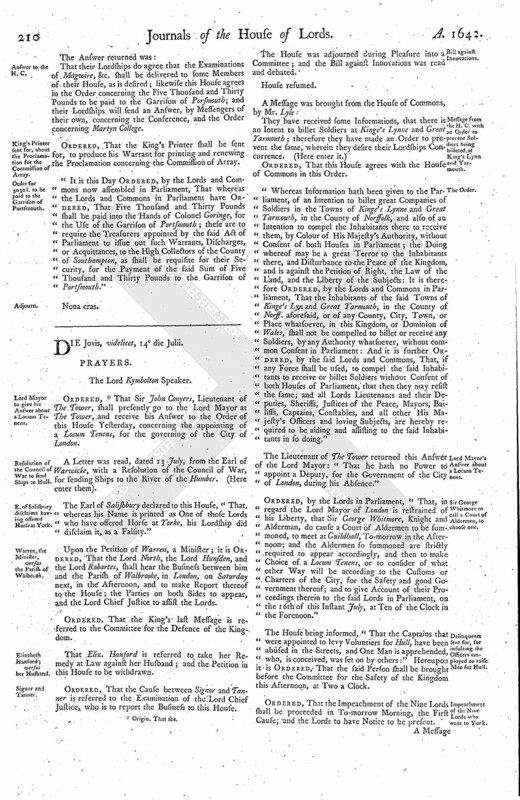 It is this Day Ordered, by the Lords and Commons now assembled in Parliament, That whereas the Lords and Commons in Parliament have Ordered, That Five Thousand and Thirty Pounds shall be paid into the Hands of Colonel Goringe, for the Use of the Garrison of Portsmouth; these are to require the Treasurers appointed by the said Act of Parliament to issue out such Warrants, Discharges, or Acquittances, to the High Collectors of the County of Southampton, as shall be requisite for their Security, for the Payment of the said Sum of Five Thousand and Thirty Pounds to the Garrison of Portsmouth.